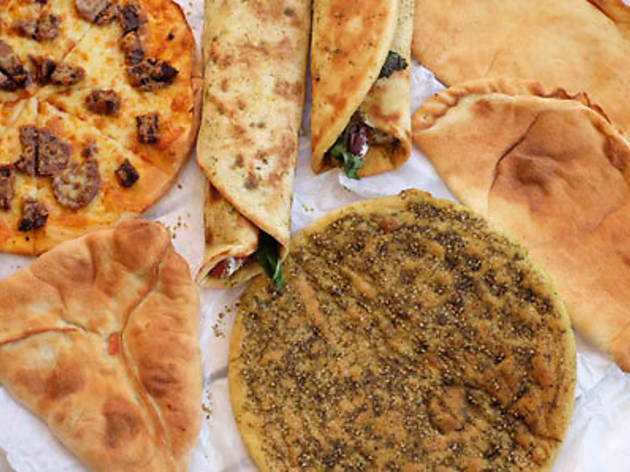 Load up on Lebanese pizza, pies and breads at this Canterbury secret, a blink-and-you’ll-miss-it bakery tucked into an alcove of shops on Canterbury Road. The locals are in on it. There’s a passing parade of tradies, mums, school kids and hungry teens traipsing through here all day. On-site parking is a bonus too. The ovens start cranking way before dawn with the shop open from 5.30am – perfect for early risers and the really late stumblers home. Head straight for the saj, a thin flatbread stretched out to about 30cm wide that’s cooked on a domed griddle called a – you guessed it – saj. The simplest version is cheap and delicious, brushed with olive oil and sprinkled generously with za’atar, a mix of dried oregano, thyme, salt and sesame seeds. It’ll set you back a mere three bucks but we recommend you go for broke and get it with the lot. The army of women huddled in the kitchen at the back will roll it up with fresh tomato slices, black olives, mint leaves and a slather of yoghurt for $4.50. But let’s say you only managed to scrounge $1.50 from the back of the sofa. That’s cool too. You can still score yourself a plain oregano pizza, smaller in size and made with a slightly thicker dough but still ridiculously tasty. You can add all kinds of olive, onion, mint, yoghurt, cheese and tomato variations to your saj or oregano pizzas for a couple more coins. The meat pizza comes with a thin layer of spicy lamb mince. Don’t forget the pies, either. 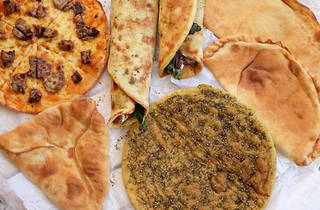 They’re a hold-all affair of dough wrapped around a filling – kinda like a pizza pocket, Lebanese-style. The haloumi cheese pie is a firm favourite with its squeaky middle but if you want stretchier cheese, go for the mozzarella version. There are a handful of tables inside and out, but most people are here for takeaway. Grab a bottle of salted yoghurt drink from the fridge and you’ll still have change from a tenner.